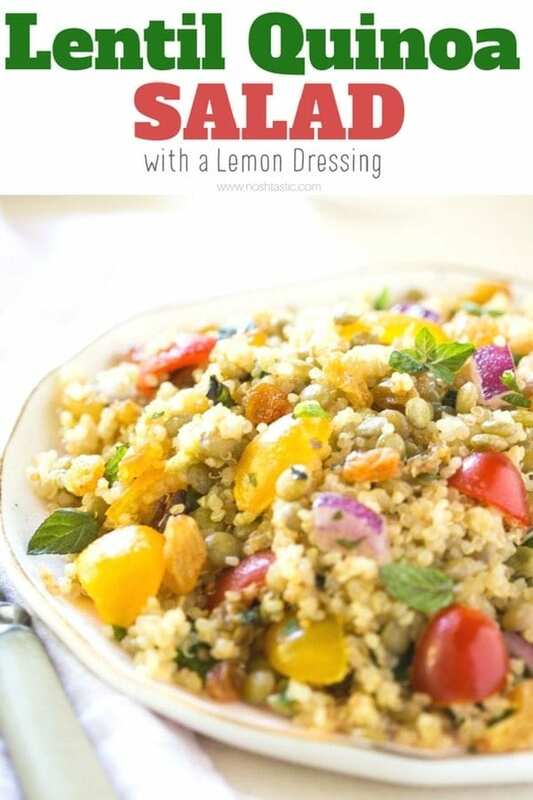 Lentil Quinoa Salad with Golden Raisins and Lemon Dressing.It’s packed with fresh flavors, is gluten free, healthy and has 8g of protein per serving. Quinoa is one of my favorite gluten free grains to cook with but I realised this past week that the only quinoa recipe I have on the blog is my yummy Shrimp and Salami Quinoa Bowls. 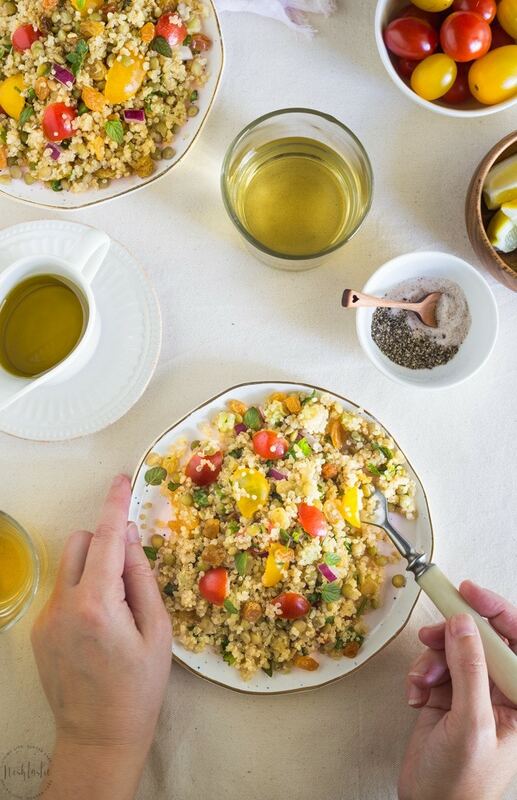 I adapted this recipe last week from one I found in a recipe book that used cous cous, I really think you’ll like it! If you’ve never worked with quinoa before then I think you’ll be pleasantly surprised as it cooks pretty quickly and in my opinion it’s much easier to deal with than rice. If you measure the water correctly according to the instructions on the pack then you should find that the quinoa will absorb almost all the water and you shouldn’t have to drain it much, if at all. I used plain old green lentils for this recipe. They did not require soaking and cooked nicely in about 20 minutes. If you can find the French Puy Lentil which are basically a more expensive fancy green lentil that comes from the French region of Le Puy then you could try them too. Puy Lentils are very nice and hold their shape much better after cooking than your average green lentil they also have a bit more robust flavor. I haven’t seen them in my grocery store here in Mississippi but I did cook with them a lot when I lived in London. You can order them from Amazon if you follow the link above. 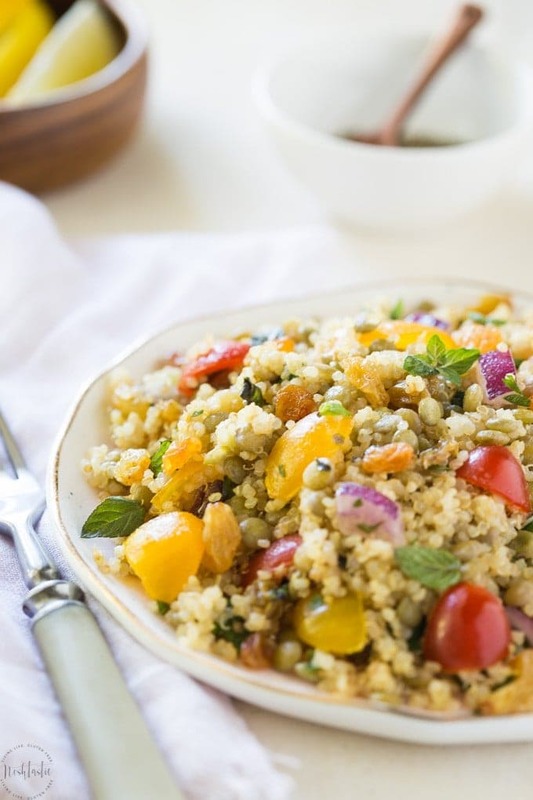 The blend of flavors in this lentil quinoa salad is so fresh and light, I think the combination of fresh mint and parsley together really transform this from an ordinary ho-hum salad to something really special, and the golden raisins add just enough sweetness. Even my children who are typically hard to please when it comes to salad ate several bowls of it. If you’re looking for some more easy recipe options then you might enjoy my Maple Roasted Acorn Squash with Thyme, it makes a wonderful Fall side dish and it’s vegan and Paleo! Or what about this Healthy Broccoli Salad from Bless Her Heat y’all, it looks really lovely! You can’t go wrong with potato salad and my easy Vegetable Potato Salad is a nice spin on the classic version. And finally you should try my Skinny Creamy Tuscan Chicken, it has all the flavor of the original version but only half the calories. Rinse lentils with cold water and cook according to the instructions on the packet, you should not need to pre-soak them. I used green lentils and they took about 20 minutes to cook. Once they are cooked, drain and allow to cool. In a separate pan rinse the quinoa and cook according to the instructions on the packet, it usually takes about 15-20 minutes. Once cooked remove from the heat and fluff with a fork, if the water has been measured correctly then the quinoa should have absorbed it all. Combine green lentils, quinoa, tomatoes, raisins, onion, cucumber, parsley and mint into a large bowl that you can serve it from. Mix together the lemon rind, lemon juice and olive oil and pour over salad and toss well. Season to taste with salt and pepper and serve chilled. I just made this and it was SO FRESH TASTING! So delicious! 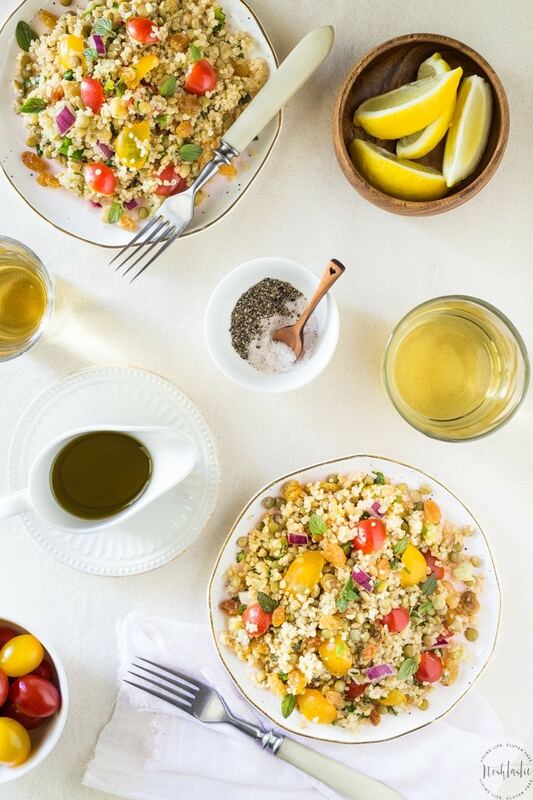 I started a detox last week that really limits me, but I’m allowed to have quinoa and lentils, so this salad is like a dream come true for me right now, and the lemon flavor takes it to a whole new level. The only think I would change would to replace the parsley with cilantro, but only because I’m a cilantro addict. 🙂 Thank you so much for posting this recipe. I really enjoyed it, and will be enjoying it again tomorrow – should have made a double batch! Hi Rachel, I’m so glad you loved it!! I think Cilantro would be lovely too, let me know if you try it.